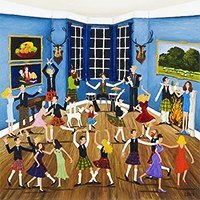 Highland Dancing — Scottish athletic solo dances. Anna Akimova is a teacher. She studied Scottish dancing in Moscow School Shady Glen under the guidance of Maria Zot'ko. She participated in workshops by Maria Zot'ko, Elizabeth Low, Rhona Lawrence, Delma Wilson and Mylene Fraser in Highland dancing and Scottish National dancing and by Sergey Alferov and Malcolm Brown in Scottish country dancing. She is multiple prize winner in Russian competitions in Highland dancing.